Unfinished: Ken Ham and Bill Nye's Dead-End Debate on Creation and Evolution: Can We Please Change the Conversation? Ken Ham and Bill Nye's Dead-End Debate on Creation and Evolution: Can We Please Change the Conversation? 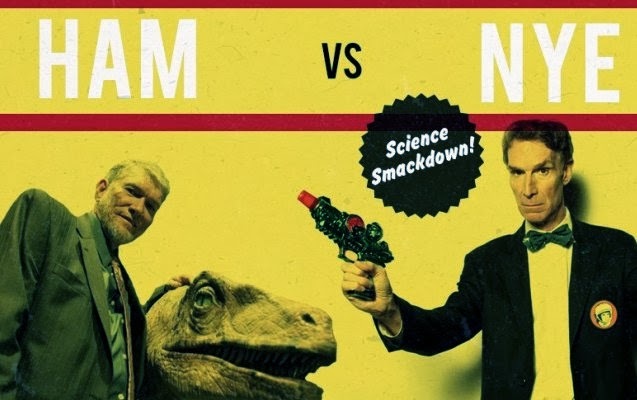 I have a confession: when it comes to the debate between Bill Nye, yes, The Science Guy, and Ken Ham, CEO of Answers in Genesis and The Creation Museum, I was initially disinterested. Actually, when it comes to the larger debate between Young Earth Creationism and Evolution Theory, I am even less interested. I believe it is time we moved beyond this dead-end debate that supposes evolution and Christian theology cannot co-exist. There are far greater and more pertinent human and ecological questions we must be asking other than where is Noah's Ark and how long was each of the six days of creation. Another confession: I really only tuned in to the debate because, let's be honest, who can pass up an opportunity to see The Science Guy on t.v. again. Aside from a recent cameo on The Big Theory, I have not seen him since I was making model cells in middle school. After watching the two icons of their respective fields battle for over two hours, my interest in this supposed "debate" failed to peak, not even a little. That's because Ken Ham is right. Not in his young earth creationism. Ken Ham is right is in his observation that this scientific tug-of-war is really a battle between two framing stories. Ham's biblical hermeneutic supposes Scripture, especially Genesis 1-3, serves the purpose of providing scientists billions of years, correction, thousands of years later the data necessary to compile a theory of beginnings and existence of life. Nye's narrative, on the other hand, is filtered through a different lens and does not see Judeo-Christian Scripture as foundational necessity for scientific discovery pertaining to the age and evolution of the earth. As Ham said, they both have the same evidence, the battle is purely over worldviews and starting points. And I don't see Nye or Ham willingly undergoing an evolution of worldviews anytime soon. When I was in high school, I would have rallied behind Ken Ham. Evolution was a direct attack on my flat reading of Scripture. When I was in college, I nearly walked out on the presentation by a representative from The Creation Museum* who forcefully proclaimed to our congregation the existence of dinosaurs as a conspiracy against the bodily resurrection of Jesus. My own worldview has evolved over the years and I have begun to see Scripture as a much more complex and sacred text whose existence is not to underscore scientific theory, rather an invitation extended to all of humanity to participate in God's unfolding story of love, justice, peace, reconciliation, and promise to make all things new and right. Yes, God is Creator. But the Bible was written neither for elementary school children studying the plants and origins of species in Eden or CEO's who founded scientific museums in Kentucky. The Bible is a collection of stories. Genesis is a hodge podge of religious narratives. In the beginning is doxological poetry for Levitical priests, ancient liturgy for the worship of YHWH. Adam, Eve, Noah, and others are not even unique to the Judeo-Christian imagination, rather adaptations of Ancient Near-Eastern religious stories co-opted and contextualized by those proclaiming YHWH as Lord in the midst of oppressive captivity. ** The Genesis stories preserved Jewish/Hebrew allegiance to the shalom of YHWH in contrast to the violent narratives of Egypt, Assyria, Babylon, and beyond. They were illustrative beckons to covenant fidelity. Tragically, these stories are slowly becoming new building blocks for ideological and theological towers, whose brick layers are bent on the ascent towards absolute certainty about this or that scientific theory of evolution or young-earth creationism. My prayer, as this Nye-Ham debate continues to gain viral status, is for the conversation to change. My prayer is for an awakening of the Spirit whereby the Bible is reclaimed not as textbook but as drama. My prayer is for the faithful to unroll the script, with an ending yet to be fully written, and rediscover fresh opportunities to incarnate the love and justice within as together we follow Jesus' embodiment of God's dreams for the world. This is the very world God made good, somehow, someway, in the very beginning, and now calls us to an evolution of generosity and grace as we love, serve, and bless our most vulnerable neighbors in need. And that's a much more perplexing and interesting conversation. Actually, this conversation is more rooted in Scripture than anything that took place between Bill Nye and Ken Ham. So who is going to host this conversation? * I did not organize this event, I swear. I still am in awe of the slippery slope arguments and straight lines drawn. **Check out a post I made related to teaching these ANE stories to youth and our contemporary need for rest: Atrahasis and Ancient Longings for Rest . See also a cool way to teach the story with youth.